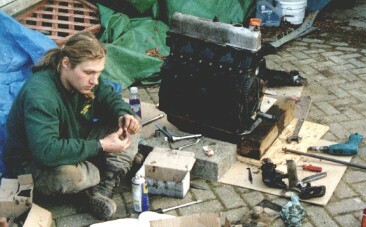 When I bought Lucy-Jo the original 2286cc Petrol engine block was cracked on the left hand side behind the manifolds. These engines crack here when insufficient antifreeze has been put into the cooling system and the coolant freezes. So that the vehicle could be used, the thermostat was removed, ensuring that on short journeys the engine never really warmed up. I had to top up the coolant frequently. Eventually, I saved up enough money to replace the engine. I bought a 5 bearing engine (that's to say it was a later Land-Rover engine which had 5 bearings on the crankshaft instead of 3) and gearbox from a friend who was breaking a Land-Rover. The donor vehicle was being broken up because it had a rotten chassis. Here's a picture of me removing the rear propshaft! I stripped the engine and took it to a local engine firm to look at. They said the block had already been bored out at least twice before, so it wasn't worth doing again. Instead they sold me another 3 bearing block they had already bored out +.010" and skimmed. They skimmed the head of the 5 bearing engine I provided, and put hardened valve seats in for running on unleaded fuel. 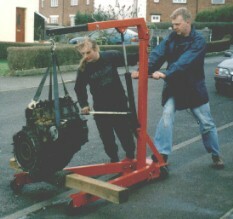 I then built most of the engine up myself with help from my friend Eddie. 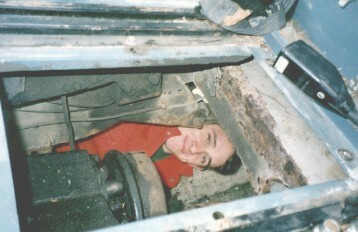 A few friends helped me replace the engine and gearbox over a weekend in the spring of 2000. As it can be very difficult to align the gearbox layshaft into the clutch when refitting an engine or gearbox into these vehicles, we tried an experiment - we bolted the engine and gearbox together and slotted them into position as one pre-assembled unit. Clearly it was necessary to have removed the radiator and front valance to do this. It was a very tight squeeze to get the gearbox through the bulkhead at an angle. It would have been easier if we had removed the gearbox mountings first.